Home / Animal Spirit Guides/Totem Animals / Congratulations New Reiki Kids!! A BIG CONGRATULATIONS to our six new Reiki kids! 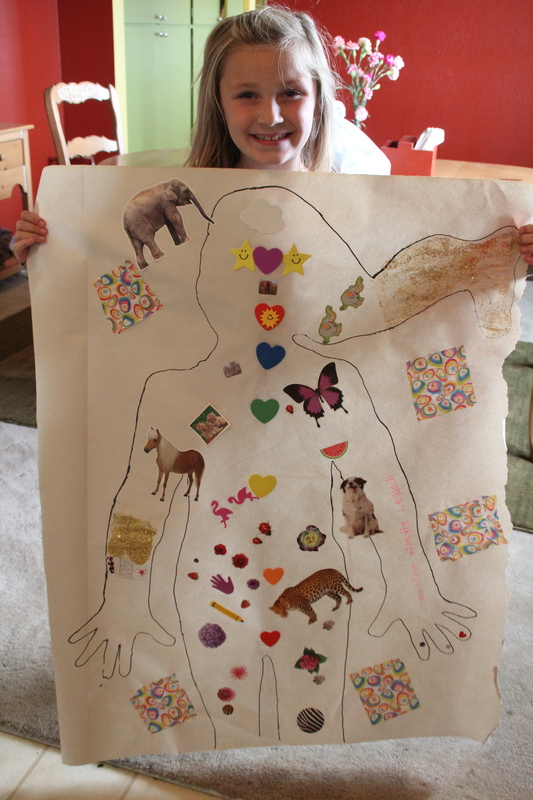 Saturday we had another Kids Reiki class. 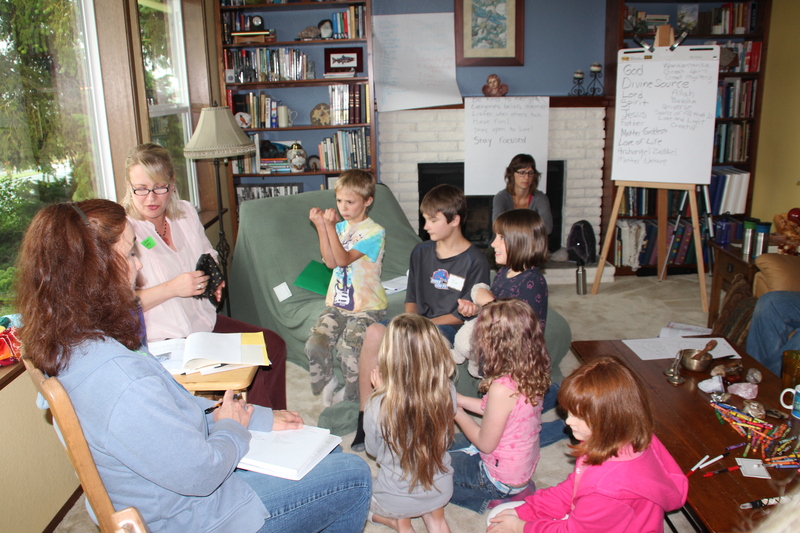 Six children and their Reiki adults celebrated Divine Source Energy by learning about Reiki, the history of hands on healing and Reiki, Reiki spirit guides and animal guides, feeling energy, meditation, chakras, auras and much more. Thank you to Tim, Jerica, Josiah, Lilly, Kayella and Makena for being so brave and loving as they learned something totally new. 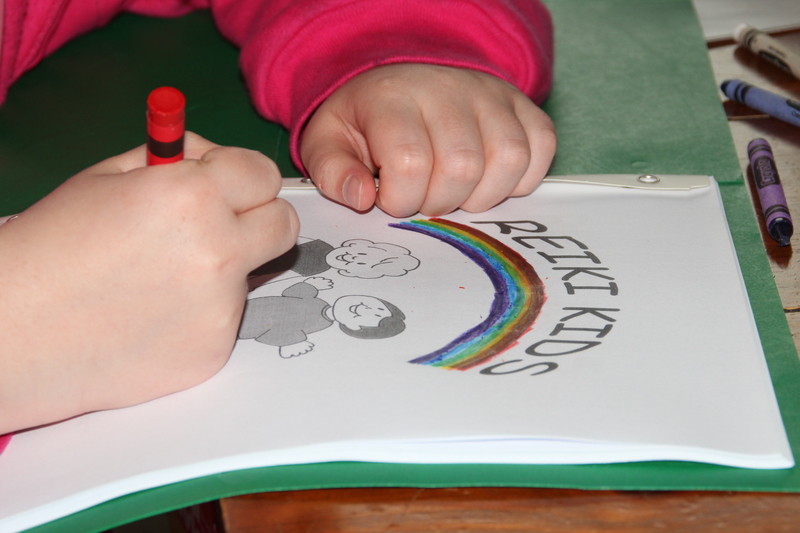 Reiki kids excited about Reiki history! We started the day talking about all the different names there are around the world for God and how they need to trust their own intuition to know what name feels right to them and their families. The kids did their very first meditation to find their safe place and then each one shared what their safe place looked like to them. Many of them saw power animals and spirit guides at their safe place. I was encouraged with how well they did for their first time and how much they seemed to enjoy it. 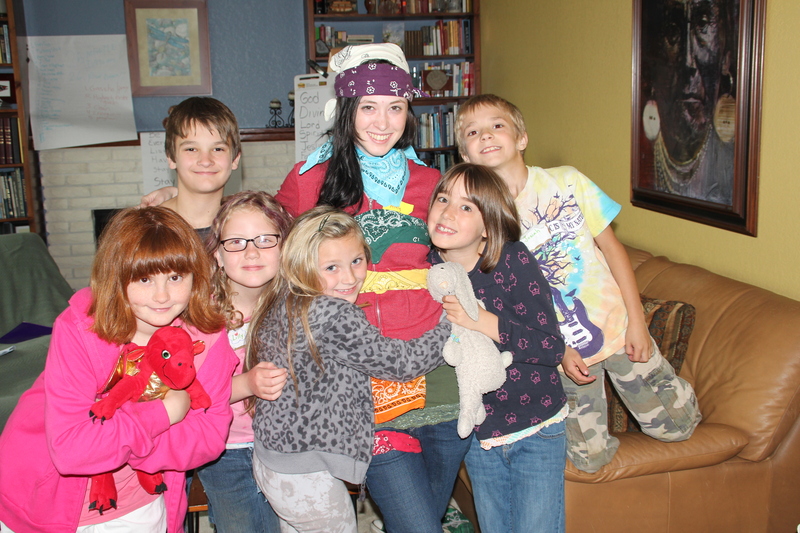 The Reiki kids wrapped colored bandanas all around Amy to learn the location and color of each of the seven major chakras. During our chakra and aura lesson we learned about the healing effects of color and how their energy is a rainbow of colors. As an example we wrapped colored bandanas around my special Reiki helper, Amy Meyers, to show them the colors of each chakra and the placement. It was a blast. Jerica with her magic eye art, beautiful! While I did the individual attunements my Reiki assistants, Amy Meyers and Lauren Holloway both led a Magic Eye art project. The kids made an almost, full sized mirror image of themselves using their magic eyes. They closed their eyes to ‘see’ what they look like energetically and then created it on a large piece of paper with glitter, stickers, cut out pieces of paper, tissue paper, crayons and more. As you can see from the photos they were extremely creative as well as intuitive. 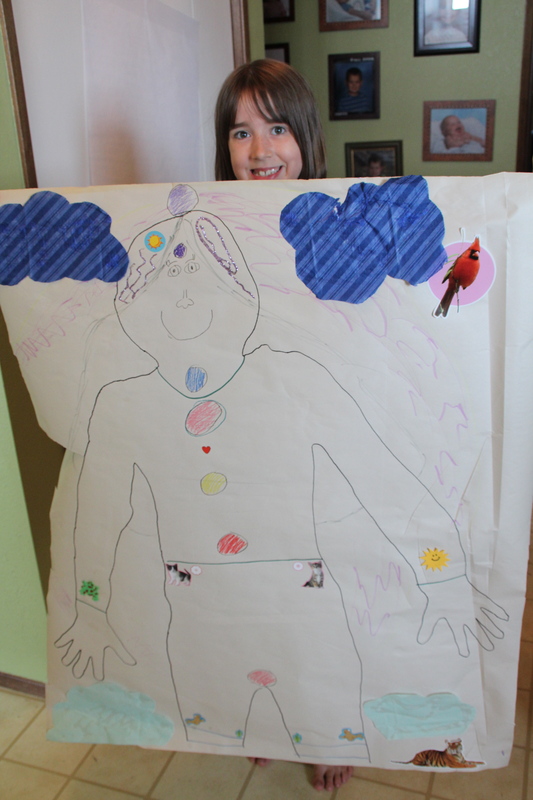 While the kids worked on the art projects I was in the Reiki room doing attunements and Reiki guide readings. 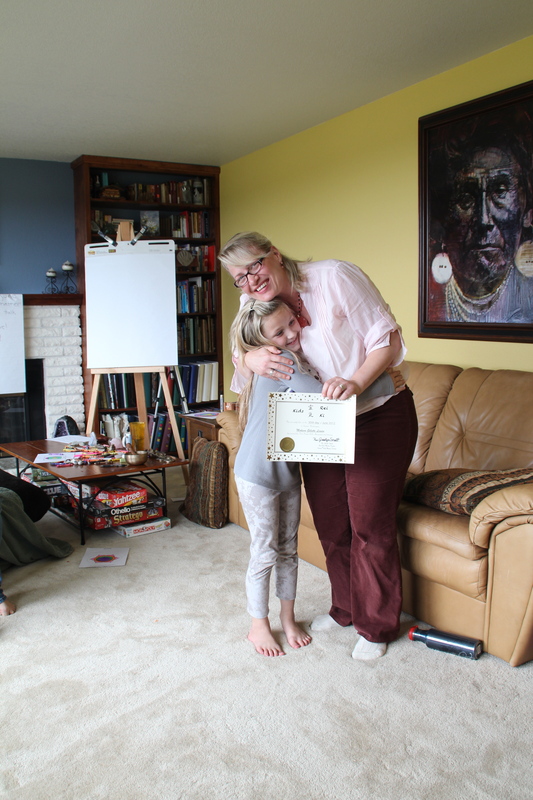 Each child choose to be attuned to Reiki and each one had a different experience during the attunement. Some felt tingles, some felt heat, some felt flowing or rocking movement while they were being attuned and some said they just felt love. I appreciate how everyone feels and reacts to the energy differently. Every attunement is different for me as well. With some the energy comes in fast and ready like the child, some comes in slow and hesitant, others calm and peaceful, others come in happy and joyful, but each one feels full of love and creates a very humble feeling of gratitude in me. I often tear up or even cry because I feel so incredibly grateful that Divine Source has entrusted this mission to me. I feel so small in comparison and yet so spiritually powerful at the same time. It is the most amazing feeling to give a Reiki attunement and especially to children. With children I can often see or feel the immenseness of the ‘mission’ they have ahead of them in this life and feel how spiritually powerful THEY are. These kids are amazing. They have a big purpose in this life and a lot to do to prepare themselves. I feel genuinely honored to be a small part of teaching these children about energy, our Divine and spiritual guides so they hopefully never lose that sense of wonder and that belief that miracles really are possible. They will so need that as they grow up in this world and doing their best to create positive change. It’s a huge calling and each time I do an attunement on a child, I am reassured that we are in good hands, that they are truly ready for this task ahead. A truly brilliant feeling. Working with these amazing kids helps my faith grow each and every time. What a blessing. 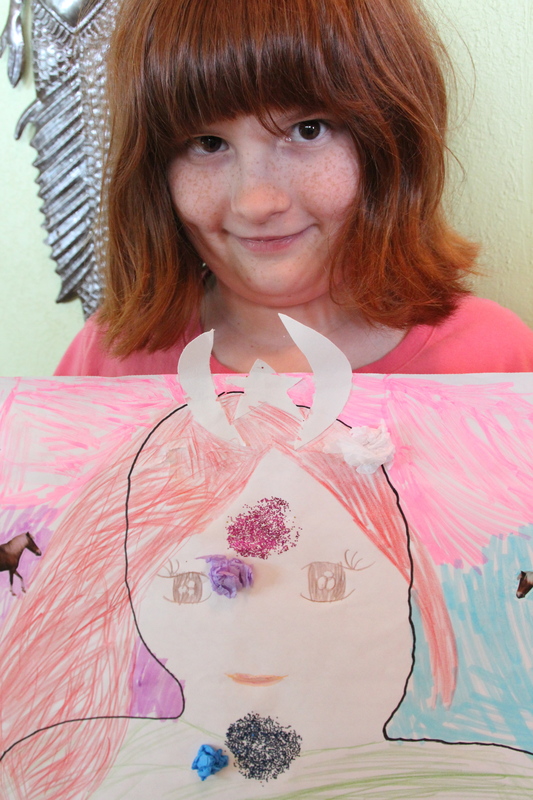 Kayella with her magic eye art, she saw birds as her power animal. After the attunement we practice FEELING the energy and healing with the Reiki. Each child and adult makes an energy ball in their hands until they can feel the pressure of something there, something between their hands that is invisible but tangible at the same time. Some say it feels hot, some tingly, some like a worm crawling in their fingers, but they all feel it. Then we combine our energy balls and the children took turns standing in the middle of them inside one huge ball of Reiki. That is always a highlight. Sometimes we sing beautiful songs to help the energy feel stronger. The more joy you feel the more the energy runs and the more likely you are to feel it on your body. This is one of the kids favorite exercises and we do it as often as we can at Kids Reiki circle. Each child receives a Reiki I certificate just like my adult students do but the kids’ certificates have gold stars on them. They are cool! We handed out the certificates and the kids went home. I always remind the Reiki adults that it is up to them to continue the Reiki training at home and support their Reiki kid by practicing with them as well as bringing them back once a month to Kids Reiki Circle. Reinforcement and practice is key to each Reiki kid being confident in their practice and learning of energy. I’m so excited to see where each of these kids go with their Reiki path. The options are endless. Love and Light to all of you wonderful Reiki kids, their parents and my Reiki helpers. Thank you to each of you for entrusting me to this very important task! If you are interested in your child taking a Kids’ Reiki class in the Sequim, WA area please call or email me and we’ll plan a class together. If you are not in the Olympic Peninsula area but want to find a Kids’ Reiki class try Barbara McKells‘ website or talk to a Reiki Master in your area about starting a kids class. Spread the word that Reiki and Kids go together better than peanut butter and jelly! I am so pleased that Kayella got the opportunity to experience kids Reiki. She had a lot of fun, and loved the bird connection that was made. Thank you Josslyn for giving such a gift to these kids. It is invaluable! Thanks Heather, but the kids truly are a gift to me. I had so much fun with them I didn’t want the day to end. So looking forward to seeing them again at Reiki circle!